Tring plantation shutters from Just Shutters – your local experts! We are a long-established company specialising solely in providing stunning plantation shutters. Just Shutters offer unrivalled product quality, service and value for money. Couple this with our market-leading lifetime guarantee and it is no surprise why Just Shutters should be your first choice! Customer satisfaction is at the core of our culture here at Just Shutters. As a result, we always strive to build a special relationship with each customer and go the extra mile to delight. Furthermore, our team are beyond passionate for design! They always provide shutters that will be the very best for your home – whatever your taste and style may be. For more information on Tring plantation shutters call us on 01727 221 298. Plantation shutters are unique in being able to offer the best of both worlds – combining beauty with practicality. -Surprisingly affordable – many people believe that shutters are expensive. However our range is very reasonably priced – use our online calculator to find out more. We are so confident in the quality and endless list of benefits of our plantation shutters that we offer a lifetime guarantee! Just Shutters are proud to offer the UK’s largest, most extensive range of shutters. Furthermore, we stock our own exclusive ranges you will not find anywhere else. These are therefore perfect for adding an authentic and bespoke feel to your interiors. Browse our incredible range of products by clicking here. 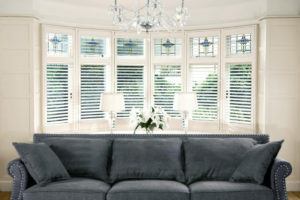 We are the local experts in Tring plantation shutters. Our team have extensive experience in providing customers with a bespoke package. They do this whilst giving you the signature Just Shutters experience – a high quality product with an unrivalled personable approach. Your local expert, Tom Parrott (pictured to the right), will organise for you to have a free home design visit where you will be presented with several samples and have a full consultation. Why not browse our stunning photo galleries to get inspired about what shutters could look like in your home? To speak with your local experts please call 01727 221 298. We will be able to give you the personalised service you require. From design to installation we are here for you every step of the way. Our team are immensely proud of the high volume of positive feedback from satisfied customers – below is a list of examples. Visit Checkatrade to view over 1600 more unbiased reviews!